He found somewhere else to be. Mom was the only one who ever changed. Once. And that led to a welcome demise. Not even the damn sunbeam! This is the second part of the "Miserere" from Act III of Verdi's "Il Trovatore," and it appears to be a translation of what actually happens here, making for a nice change from a tendency of the editors to employ instead a nice little song about chirpy birds or a moral lesson about honesty or posture. The orchestra accompaniment is absent, and in its place we have the song expanded to four-part harmony. I'm not sure what's up with "All Glory." The first part is something I've heard in a Christmas carol, and then the second part goes somewhere else entirely. Where's the Hosannah in Excelsis? I can't think of the title now, and am too lazy to search through all my books of carols. note: "All Glory" spills over into this page. I'm mostly not going to bother mentioning when that happens. "Am I Not" is a semi-translation of "Du, Du, liegst mir in Herzen," which we used to sing in grade school. My fifth-grade teacher taught us little bits of German. This version loses the part where the object of affection makes the singer unhappy even though singer is so good to object and just makes it a sappy little love ditty. "At Evening-Time" is a straightforward 6/8 Allegretto with no surprises in its pastoral imagery of dusk. p 28: "Ah, For Wings To Soar", "Away With Melancholy" [W.A. Mozart], "Annie Lisle" [H.S. Thompson]. "Ah, For Wings" is a straightforward 6/8 Andante with no surprises in its lyrical whining to an unresponsive love. "Away With Melancholy" is a tune from "The Magic Flute." The lyrics here don't correspond with what's in the opera (surprise! ), which had a lot of "la la la" going on. Apparently the tune had quite a busy life both as an adaptation from the opera and as a song, and existed in multiple arrangements for all sorts of instruments. J. Pierpont, original writer of Jingle Bells, set one for his glee club with lyrics that apparently started to vary with the second line. Fernando Sor wrote an utterly charming set of variations for guitar on the theme, which I play on keyboard, because why not? The Great Song Thesaurus says the lyrics are anonymous, and I believe it. 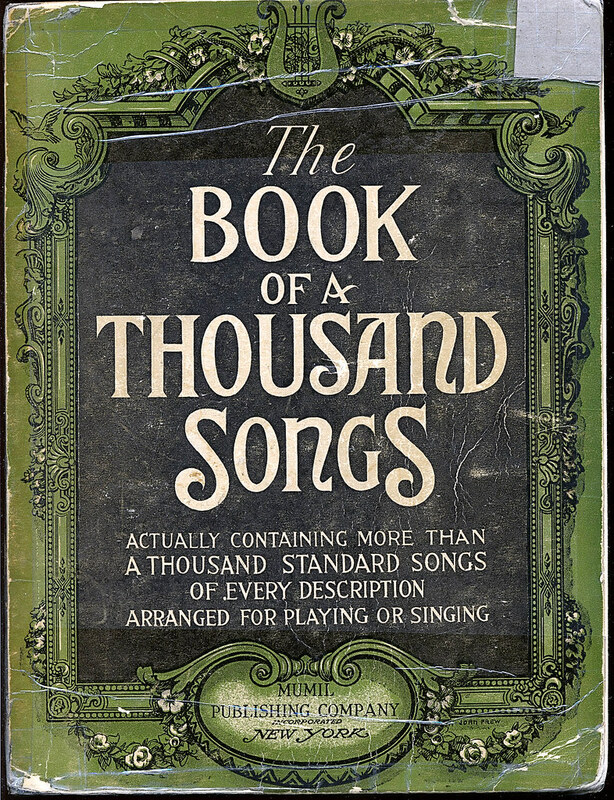 I browsed a rather substantial article online to learn more about the piece, and one of the scanned musical examples in it was right out of the Book of a Thousand Songs. "Annie Lisle" is a pleasant Scots tune from 1860, with rhythms that snap (especially on the unexpected short-long pairs) and some nice variation in the accompaniment. It may sound familiar to Cornell grads, as it was adapted in 1872 to become "High Above Cayuga's Waters." I learned recently that Cayuga is a lake. I suppose everybody else already knew that. p 29: "All Hail The Power Of Jesus' Name!" [Oliver Holden], "Ah, Tell Me Why" [A. Warlamoff]. This is a hymn we used to sing at Northside Baptist. One week our friend Nancy announced it and it sounded a little like she said "All hell," and we kids laughed and laughed. What boring lives we must have led. "Ah! Tell Me Why" is another misunderstood lover song. Warlamoff would appear to have been a Russian who wrote vocal and choral music. No idea if the lyrics belong to the song. Wieniawski and Kullak both made arrangements of some of his tunes for their respective instruments. p 30: "Adieu! 'Tis Love's Last Greeting" [Fr. Schubert], "Amici". The Schubert seems to be well-known as a song and a choral song. No idea where the English lyrics come from. It's a graveside love song, so it could well be a translation from the original (presumably German). No trace of Schubert's piano style can be found in the four-part setting. "Amici" is another borrowing from "Annie Lisle" (see p 28), so I pencilled Thompson's name in on the score. p 31: "All Quiet Along The Potomac" [Mrs. Ethel Beers, J. Dayton], "Angels Ever Bright And Fair" [Handel]. Seems like it should be called "All Quiet Along The Potomac Tonight," as this was the form in which it was published in the 1860s. It was first a poem called "The Picket Guard," written by Mrs. Beers (bylined just E.B. at first) based on telegrams by Maj-Gen McClellan following the First Battle of Bull Run. The song was set to music by John Hill Hewitt, but that's not the version in this book. It's similar, but not identical. And some creep named Lamar Fontaine seems to have tried to grab credit for the lyrics. He must not get away with it. "Angels" is from a Handel opera, "Theodora." The arrangement starts out with one voice, adding more to end up with four at the end. p 32: "All Souls' Day" [Edward Lassen], "Angry Words". A light arrangement of an art song from a past master — possibly somewhat neglected now, but I could be wrong. It occupies the middle ground between a love song and a memento mori. "Angry Words" is another little life lesson, presumably for the kids. The melody doesn't remind me of anything in particular. p 33: "Angel's Serenade" [G Braga]. This once-popular song can be found in arrangements for many instruments, including a piano version that's in a lot of older collections and was apparently adapted as a theme for some incarnation of "Amos & Andy." The Child hears the sound of angels, The Mother hears nothing, and the angels end up taking The Child. It's somewhat less dramatic and menacing than Schubert's "Erlking," but it's the same plot: Child hears supernatural entity who takes it away. The arrangement follows the narrative, and may be thinner than some versions but still carries it all, putting some of the accompaniment into the right hand along with the melody to do it. There are even a couple of four-note chords in the right hand. One of the more challenging pieces in the book so far. p 19: "Angel Gabriel" [J.E. Stewart], "A, B, C, Tumble Down D" [no credits]. The latter is a puddin' and the former is a fake. "Angel G" is a 'gwine' song with a credited writer, so it would seem to have been intended for a minstrel show or perhaps a book of sentimental songs of the south. Dotted rhythms, but very little syncopation. "ABC" is in 6/8, which isn't the way I heard it on a kiddie LP we had in the house when I was a kiddie. I recall thinking it was the stupidest thing I'd ever heard, but I guess I hadn't heard a lot of things at that time, because it's been topped repeatedly since then. Is this the first song in the book that has no writer credited at all? It's far from the last. A perfunctory Google offers no hints. p 20: "Afterwards" [Mary Mark Lemon, J.W. Mullen]. Unless otherwise noted, the lyricist's name precedes the composer's. A sentimental song with nothing that strikes me as remarkable in the lyrics. The arrangement, which I expect reflects the composer's work, though it adheres to the general rule of the book in having no chord thicker than three notes in either hand, varies the figures used and seems to be competent and craftsmanlike, if not stunning. p. 21: "Ave Maria" [Bach-Gounod], "Ah, 'Tis a Dream" [E. Lassen]. Bach's most famous prelude, the first from Book 1 of "The Well-Tempered Clavier," was used by Charles Gounod (best known for his opera "Faust" and for "Funeral March of a Marionette," which was used as the theme for Alfred Hitchcock's TV show) as an accompaniment to the melody of an Ave Maria. The view that this was a wonderful achievement is undercut by George Bernard Shaw's claim that all Gounod did was pull out the underlying harmony Bach put in. Still, it's popular to this day in all sorts of arrangements. This one leaves out the Bach prelude completely and gives a choral setting (SATB) of the Gounod part. You could play this and have a friend play the Bach on another keyboard, but you'll have to transpose the prelude up to G to match the key, and be sure and use the version of the prelude with the extra measure Schwenke inserted, which is most of the versions you'd have found before modern scholarship started asserting itself on the matter. Lassen's song is a nostalgic wish for home, written in 9/8 with some duplets for emphasis. Wier let this one go on for three verses. Maybe he liked it. p. 22: "Araby's Daughter" [Thomas Moore, E. Kiallmark], "Annie Laurie" [Lady John Scott]. Here's Moore again, going for the exotic this time. 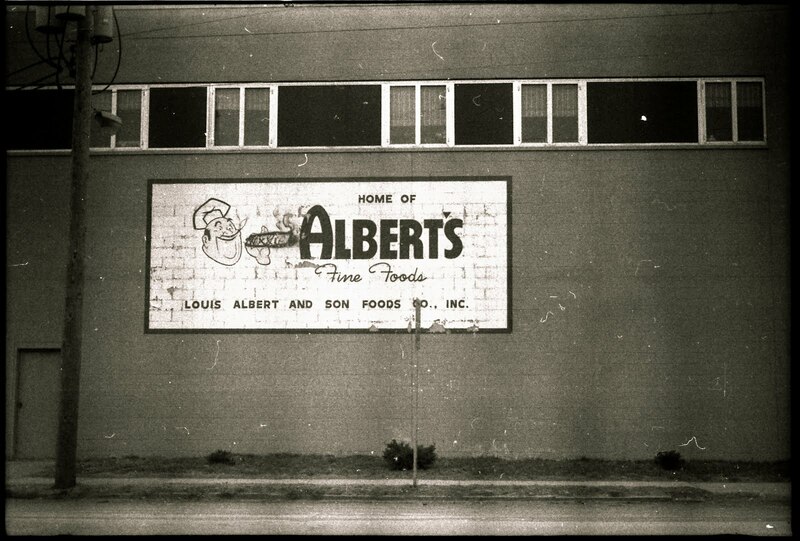 He had a lot of songs on the hit parade, and a number of them still ring a bell today. Kiallmark doesn't ring a bell, and unlike Haydn, we don't see his name and wonder which of his many works was used in the creation of this song. The 6/8 rhythm is dotted and snappy, but not unrelievedly so. "Annie Laurie" was a real person, erstwhile sweetie of William Douglas, who wrote the poem Alicia Scott modified and added a tune to, modified from one she had written for another Scottish setting. Douglas's own authorship is sometimes questioned because of the original poem's similarity (altered by Scott in her setting) to "Jon Anderson, My Jo." However, the first and third verses aren't questioned, and he really did go out with Annie Laurie before marrying someone else. p. 23: "Angels Meet Me at de Cross-roads" [W.S. Hays], "Alma Mater, O"
"To My Friends: If I have done wrong in publishing this book, forgive me." The song itself is nothing much special. He also wrote "Irish" songs. "Alma Mater, O" is a run-of-the-mill toast to the college one is about to leave, and the tune seems to be nothing more than the first strain of "The Wearin' of the Green" sung twice. Four times, if you sing both verses. p. 24: "Angelina Baker" [Stephen C. Foster], "A-Roving"
Angelina's another sweet dead chick that the blackfaced narrator misses. For a sad song, it's rather sprightly in a 2/4 Allegretto, and ends with an incongruously catchy rhythm on the line "She left me here to weep a tear, and beat on de old jaw-bone." "A-Roving" shows the folk process at work, circa 1918. The version of this that I always hear has more snappy rhythms than the comparatively square setting here. Needless to say, this version is also cleaner than I generally hear, too. I suspect Farnie simply showed up uninvited one day and imposed his lyrics on this to make a song, as the melody is Czibulka's gavotte "Stephanie." The composer was a bandmaster who wrote a lot of Viennese trifles. "Love's Dream After the Ball" turns up in old collections, as does "Stephanie." He may be best known for "Hearts and Flowers," a song for which Tobani took full credit, but which seems to be lifted wholesale from "An Old Winter's Tale." The theme can be heard during many pathetic moments in silent movies and old cartoons. "All Through the Night" is a lullaby everybody should know. My favorite arrangement to play is not this one, but rather the one in Gems of the Universe, a smaller collection that's jam-packed with great songs (I played all the way through it over a few days when I lived in Virginia, so this project is not entirely unprecedented). Also posted to my Live Journal. In which I begin my traversal of The Book of a Thousand Songs [Wier, 1918]. The music follows a lengthy (as you might imagine) table of contents which somewhat mirrors the organization of the book. Alphabetical order guides but does not dictate placement -- Wier, or whoever did these things for him, was sensitive to layout and convenience. As a result, there are very few places where I need to turn a page once I'm playing a piece. I noticed one the other day and was almost shocked by it. So the book is roughly alphabetic, but not fanatically so, with the same relaxed sort of organization as my two comb-bound books of photocopied music (almost entirely stuff I own or which is out of copyright), only they're on a vague chronological scheme. The first page forsakes even rough order in order to be patriotic. p 12: "America" [Samuel F. Smith], "The Star-Spangled Banner" [John Stafford Smith, Francis Scott Key]. The editor relaxes his usual method of presenting no more than two verses and gives four for "America." The Book of World-Famous Music [Fuld], a valuable reference on such matters, says that nobody's sure whose tune it is. The Great Song Thesaurus credits a Mr. Harris. I penciled in John Stafford Smith for "The Star-Spangled Banner." It's not that I'm tentative; it's just that a pencil is what I keep by the piano. The melody varies a little from the standard version we hear. There's a little less martial snap to it. The song didn't become our national anthem until 1931, but it was already popular in 1918 so its inclusion isn't surprising. p 13: "At Pierrot's Door" [French folk song]. I played this way back in the first time I tried (and failed) to take piano lessons from my Dad, as "Au Clair de la Lune." p 14: "Alice, Where Art Thou?" [J. Ascher], "Abide with Me" [H.F. Lyte, W.H. Monk]. The former would seem to be the source of a snippet Dad used to pop out with at odd moments, "Al-ice, where are you go-ing?" (To which the answer was "Down the drain.") Neither lyric is actually in the song. "Abide with Me" is one of those hymns I've heard over and over, over the years. p 15: "Ave Maria" [fr Cavalleria Rusticana by Pietro Mascagni], "Auld Lang Syne" [Traditional, and Robert Burns]. Instrumental opera intermezzo with (religious) words attached. Giovanni Targioni-Tozzetti and Guido Menasci, the librettists, had nothing to do with this, so I won't be writing their names in on it. I added "Trad" to "Auld Lang Syne" because Burns didn't write the first verse. The melody first showed up as a germ of its present self in one of Playford's dance tune collections and was modified in subsequent appearances. The folk process at work. p 16: "As Down in the Sunless Retreats" [Thomas Moore, Joseph Haydn], "As a Little Child" [C.M. Von Weber]. Thomas Moore gave us songs and lyrics that are still remembered. Some may have been original, many were taken from Irish and other folk sources. We'll run into him later, with "Believe Me, if All those Endearing Young Charms," "The Minstrel Boy," "The Last Rose of Summer" and, well, more. I'm not sure how he got together with Haydn, but it seems he wrote a poem and used something Haydn had left sitting around for a tune. I don't know enough Weber to say if this is a translation of something he really set or if it's one of those didactic little bromides some educator cobbled together. p 17: "Away Down Souf" [Stephen C. Foster], "Aura Lee" [W.W. Fosdick, Geo. R. Poulton]. Foster wins the previously unannounced prize for first use of the N-word in this collection. Seemed to me at one time that minstrel songs were an opportunity for uptight whites to express emotions that were too real for other songs, but I may have been wrong. Anyway, this is one of the happy ones, and that's an emotion I don't see as much of in white songs of the time -- they were more into sweethearts dying young and like that. I had to write in both writers' names for "Aura Lee," courtesy of The Book of World-Famous Music. Elvis Presley covered this in the 50s as "Love Me Tender," with lyrics mainly by Ken Darby. p 18: "Ah! So Pure" [F. von Flotow; w: W Friedrich]. A memorable air from a somewhat forgotten opera. I added in the writer of the lyrics, though the translation is anonymous. I like to play the version of this that's in Gems of the Universe, and tend to imagine it being sung by Carl "Alfalfa" Switzer. Now I'm worried. I didn't plan to write about every song. Maybe these were just special or something. I'm sure I'll have nothing much to say about "Angel Gabriel" on page 19. But it's late now, so I'm off to prepare for bed. Night, all. Mirrored at my Live Journal. Edited slightly for format and words out. ps: If somebody out there can tell me how to pad the picture so it doesn't crash into the text, please clue me in. I've tried all sorts of permutations of "padding" "cellpadding" and "border" with values in and out of quote marks, with and without px after, and using equal sign or colon. Guh. 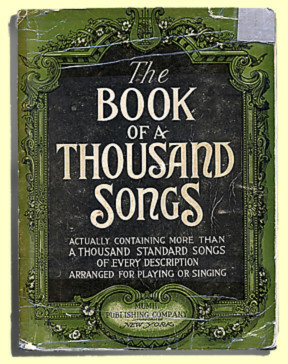 The Book of a Thousand Songs. I first saw it on a shelf at Southern Music in San Antonio, TX, and a quick look convinced me I didn't need it. After returning home to Georgia, I suddenly decided I needed it after all, ordered it over the phone, and found that it's a trove of slightly shopworn treasures. The songs go from being as short as one line to taking a couple of pages, divided between ones that look like choral settings, ones that have a melody in one hand and the accompaniment in the other, and ones where the melody is woven into a rich enough piano part. When we lived in Virginia, I found a second copy of this book. My first is a large volume, a little over half the thickness of a ream of paper and about the same size otherwise. The second copy was printed during wartime, so it's more petite and the paper is thinner. I rigged a cardboard slipcase for it and carried it in my backpack for years. I'm glad to have the lighter copy, as the somewhat improvised music stand on my electrical piano is not at its best with large, heavy volumes. When I get that messed-up hammer wire fixed on the other piano this won't be a problem. Sentimental songs! Operatic songs! Sacred songs! Hymns! Children's songs! Southern songs! College songs! Sea songs! Rounds! Patriotic songs! National and Folk songs! This book was put together back in the dim, forgotten days when it was actually possible for a song to come out of copyright (that's right, kids! ), so it has snappy pop numbers from a couple of decades before 1918 and on back. It has classical tunes with sappy bromides fitted in place of the original dramatic intent (along with ones bearing apparent translations that are at least intended to be faithful) such as school children probably suffered to while developing a solid loathing for any and all forms of culture and uplift. The book's most endearing feature is that it lets me make connections. I play this one, and realize where that tune comes from that I used to hear in the background of a cartoon, or where the lyric that Krazy Kat sings to himself is from. I play that one and it dawns on me that it was parodied in a Lewis Carroll book. I find more songs by Septimus Winner, a particular favorite, who wrote "Listen to the Mocking-Bird" and "Whispering Hope" under a pseudonym, as well as "Ten Little Indians" and "Der Deitscher's Dog" -- which we seem to know now as "Where Oh Where Has My Little Dog Gone," and which is as often as not generously credited to the prolific "Anonymous" in these lazy times. I showed this to my musician father, and he now has a copy of his own. He also likes to do what I do, which is to play through it aimlessly, annotating when a light bulb goes off; writing in a missing composer or lyric source (Claribel! Dekker!) or other trivium ("It's possible that The Old Grey Goose is a parody of this"). I recently mentioned to Dad that I was playing through some pages in the book, and he asked how far I'd gotten. Oh no, I said, I meant I'd just started in the middle and had played a half dozen or so pages… but it got me thinking. Why not, I thought, start from the beginning (like I did once with Gems of the Universe) and play every song at least one time through, repeats optional? So I did. Updates to follow. I'm up to about page 32 now. I don't intend to write about every song, just to hit the interesting spots. If the book interests you, it's still available, and probably not more than about 100% more than I paid for my first copy, which was ten bucks. There are also scans of it online, or there have been. If I come across it again, I'll post a URL. I have my own set of scans that I made for my own use, so even though I'm not carrying the book in my backpack these days (it's getting fragile, and I gave in and taped a couple of pages that wanted to be free), it still goes a lot of the same places I go. Of nearly hypnotic interest is this monthly archive of cycling paths and such kept by the Warrington Cycle Campaign (UK). These are the most amazingly perfunctory and ill-considered so-called accomodations imaginable. Month after month of them, with understated comments pointing out the "benefits" of each facility. This bull trap can be found Sustrans route number 53 from the North coast of the Wirral to Chester. It is to protect cyclists from being trampled by the herds of migrating wildebeast common in this corner of Cheshire. See foot-wide paths squished between pedestrians and opening car doors, fourth-dimensional hops, embedded obstacles, and dead ends. Every one of them is, seemingly, designed to fail by bureaucratic hires attempting to fulfill some sort of mandate they don't give a tinker's dam about. Have you ever noticed how cycle paths accumulate litter, or that there is never anywhere to get rid of your sweetpapers? Well this could be the solution of the future. The facility has been carefully placed in the middle of the cycle path so that it can be used by cyclists passing in either direction. Note the precision engineered tilt to accomodate cyclists leaning into the curve. It may be of comfort to U.S. bicyclists to know that officials in other countries care just as much as those in our own. My window here opens out at ground level, and through the slats I could see an animal's legs on the porch. A cat perhaps? I went back to getting Sarah ready for school and the bus. Snow on the ground this morning. Must remember to get my car out of the garage so Cathy can park there when she comes in from Boston this afternoon. As usual, Sarah was outside first. "Dad! Matty's here." Matty was the dog next door, friendly enough but still puppy-rambunctions. Sarah encountered her a couple of times a day when coming or going to Zach's house. Our back yards join at the property line under the utility wires, and our front doors are 2/3 of a mile apart by car. Sarah said she scratched her one time, probably from trying to jump up -- sometimes she was too friendly. This morning, she was polite but skittish. She came when I called her, and she was willing to come with me to the back yard, but making eye contact and then looking at where I wanted her to go (a trick that had worked to perfection once in Virginia when a neighbor dog had escaped their wooden fence) didn't get me anywhere. I went in to get my phone. "Don't let her go in the house!" Sarah cautioned, but Matty didn't seem inclined to follow me in anyway. Frances was on the stairs, as usual, rubbing her sides on the rails and angling for some pets. I came out with the phone and called over. Their number was the most recent on my list. I'd used it a day or two ago when Sarah had kicked off a boot that proceeded to hit Zach in the face. "Hello?" Zach's mom sounded sleepy. Perhaps she'd worked late at the ER last night. "This is Kip. Matty's over here. I tried to get her to go back, but she's just hanging around here." Deb thought about it. "The battery in the invisible fence thing might be low. She probably doesn't want to cross it. You could take her collar off." I wasn't keen on that, because Matty was acting pretty nervous. "I'll come over there and get her in a couple of minutes." I said I'd stay with her until then. Sarah petted Matty. "She likes getting pets on her tummy," she told me. "She should lie on the porch instead of on the cold snow," I said. "She likes to be a snow dog." Sarah explained. "Where's that dumb bus?" I suggested that the snow might be slowing it down, though it was a pretty light snow. A minute later, it showed up. "Don't let her get on the bus!" she said. She petted Matty one last time and then dashed to me for a kiss before going down the driveway to stand ten feet away from the arriving bus. Sonali ran across our yard to get on with her (Sarah's friend from two houses away tended to make the bus just in time, more or less). I tried to get Matty to follow me to the back again, but she opted to stay by the corner of the house and watch as I whistled. This time I saw something I hadn't noticed before -- a small pile of what seemed like they could be deer droppings. I saw that the sleeve over one of Sarah's tiny apple tree seedlings had fallen partway and straightened it back up. Then I could see Deb coming over, and then she started calling to Matty. "Matty! Silly dog. What are you doing over here?" "She might have followed a deer. I just saw a pile of droppings -- it's a miracle nobody stepped in it." Everybody had walked within a foot of the footprint-sized pile. If there were any hoof prints in the snow, we'd wiped them out. Deb removed the electronic collar so it wouldn't keep Matty from entering her yard, and escorted her back to her own side. "Oh yeah, she's a lot more comfortable now," said Deb as Matty went into full happy mode. "Thanks for calling us!" I thought about poor Matty as I went in. A deer, perhaps, lured her across the invisible fence, but nothing could lure her back across the electronic barrier, so she picked our front porch as a sort of haven. It was lucky for her (maybe she smelled us here) that she'd found friends. A fence works both ways.